Bella feels jealous for the first time when her cousin visits Crystal Castle and gets along a little too well with Glimmer in the third book in the Unicorn Magic series! Princess Bella is super excited to have her favorite cousin, Violet, visit her at the Crystal Castle! Bella can’t wait to introduce Violet to her best friends, and of course, her unicorn, Glimmer. 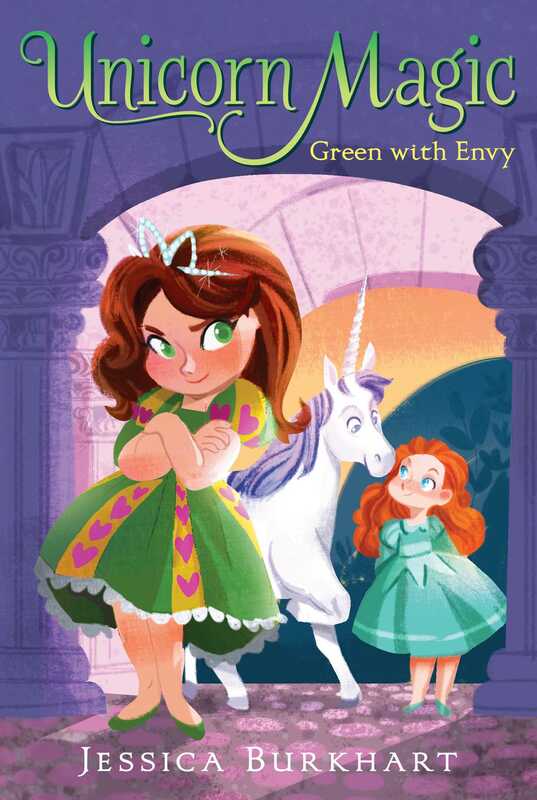 When Sofia arrives, everyone loves her—especially Glimmer and her BFFs, Ivy and Clara. Soon, Bella feels something she has never felt before: jealousy! Will Violet have Bella seeing green for the entire visit? “Next Friday is going to be the best day ever!” Princess Bella said to her two best friends. Ivy and Clara walked beside Bella as the three girls left their classroom on Friday afternoon. The girls had school every day at Crystal Castle—Bella’s home—and shared the classroom with six other third-grade students. Most of them, like Ivy, had parents who worked at Crystal Castle. Another student, older by a year, was Ben. Ben had just joined Bella’s class when he had come to Crystal Castle to be an apprentice for his uncle Frederick. Frederick was the royal stable manager, and he had put Ben to work helping care for the castle’s prized unicorns, including ­Bella’s own unicorn, Glimmer. Bella’s closest friends weren’t official “royals,” but they were princesses to her! “I know!” Ivy said. “No school for an entire week! I love spring break!” She slung her pink shimmery backpack over one shoulder. Pieces of her white-blond hair were twisted and held off her face by several rhinestone butterfly hair clips. The enchanted butterfly wings fluttered open and shut, making the gemstones sparkle. “That’s so exciting, but I’m with Bella,” Clara said. “Friday is huge!” Clara, the most outgoing of the three friends, skipped ahead a couple of steps, then turned around and walked backward so she faced her friends. Clara’s backpack, covered in teensy blue lights that flashed on when the bag moved, rolled beside her on wheels over the ­castle’s marble floor. Bella and Ivy giggled at Clara as she almost tripped over her own feet. Bella smiled at the thought of spending more time with her classmates. Lately, the princess had barely enough time to see her besties. “Plus, there’s an extra surprise that I didn’t tell you about yet,” Bella said mysteriously. Clara stopped so suddenly that Bella and Ivy almost plowed into her. “Spill!” Clara said, her long strawberry-blond waves swishing around her shoulders. “Tell us!” Ivy added, making wide eyes and pouting. “Stables. Yes! Let’s go! I want to know the extra surprise!” Clara said, grabbing the hands of Ivy and Bella and pulling them forward. They ran, laughing, down a long hallway in the castle. The girls stopped in front of the giant wooden front door, and Clara told her backpack to “stay.” Ivy put hers beside Clara’s, and Bella dropped her own purple one on the pile. A castle security guard, gleaming sword at his side, opened the door for them. Bright sunlight almost blinded Bella for a moment as she skipped with her friends across the Crystal Castle lawn toward the stable. Bella carefully looked over the grounds. She wanted everything to be perfect for her ­surprise. But there wasn’t a thing she would change. Royal unicorns, white as fresh snow, munched on emerald-­colored grass in pastures on both sides of the castle’s driveway. A few unicorns were ­napping—flat out on their sides—and soaking up the sun. The weather was perfect—warm but not too hot. It was Bella’s favorite time of year. The girls reached the stables and slowed to a walk so they didn’t scare any of the unicorns. The royal stables had a mint-green exterior and a black roof. Inside, a large main aisle had a row of stalls on either side. Since it was so nice out, most of the stalls were empty, as the unicorns were outside. But at the end of the left aisle, a closed stall door held one very special unicorn. Bella craned her neck, looking for Ben. She couldn’t help but smile when her ­beautiful unicorn stuck her head over the stall door. The purple tinted unicorn neighed excitedly when she saw Bella. Bella slid the giant bolt on the stall door and opened it. Ivy and Clara followed her inside, shutting the door behind them. “Hi, Glimmer,” Bella said softly. “Pretty girl.” The princess hugged Glimmer’s neck while Ivy and Clara petted her. Glimmer bumped her velvet-soft nose against Bella’s hands, making the princess laugh. Bella and Glimmer shared a very special bond. 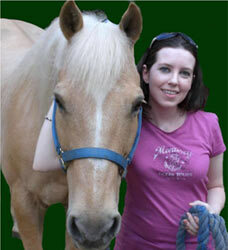 Just under a week ago, Glimmer had disappeared from the royal stables. At first Bella had been certain her unicorn had been uni-napped, until she got help from Ben, Ivy, and Clara. They learned that Glimmer had run away, and after days of searching, Bella had found Glimmer deep in the scary Dark Forest. The princess had pleaded with Glimmer to follow her out of the dangerous woods. She wanted Glimmer to be safe, even if Glimmer didn’t want to be her unicorn. As Glimmer had nudged Bella’s hands just now, it was something the unicorn had done in the woods. When Glimmer touched Bella, something magical happened between them. Bella was able to read Glimmer’s body language and, almost like mind reading, be able to tell what Glimmer was thinking or how she was feeling. That day, surrounded by the Dark Forest, Glimmer had told Bella that she was scared to be the princess’s unicorn. Glimmer loved Bella more than anything, but worried she wouldn’t be good enough. Bella assured Glimmer that the unicorn was perfect and everything she wanted. Princess Bella jumped, startled, as Glimmer bumped her hands a little harder. “It’s like Glimmer’s saying, ‘Earth to Bella,’” Ivy said with a smile. “True. She’s also saying, ‘Get me a treat, please,’” Bella said. The girls settled onto the clean straw and Glimmer, not wanting to be left out, folded her legs under her and delicately lowered herself to the stall floor. A small burst of sparkles shimmered into the air. The photo appeared in the air, and Ivy and Clara tilted their heads to see it. Clara nodded. “I will. Camera, I’m finished.” The image of Glimmer vanished. “So do you guys remember my cousin Violet?” Bella asked. Foris Kingdom was on one of four sky islands—pieces of land that floated way above the clouds. A person could only reach another island if a rainbow or moonbow was cast. Then the sky island was in walking distance. Ivy and Clara both frowned, sticking out their bottom lips.